I had planned to have started labelling the new 360 blocks for the collection but hit a minor snag when I discovered that I only had around a third of the number I needed in an unlabeled condition. A further third needed stripping (removing the old labels) leaving a shortfall of around 120 or so. After some juggling of the existing collection I was able to sacrifice around 20 blocks per colour (I reduced some troop types as experience has shown I had rather more of certain units than I needed). After having made up the number of blocks I needed I then set about reorganising the storage boxes to accommodate the additional types. So far, so good....or so I thought. 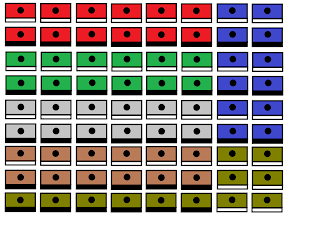 It is now impossible to keep all of the blocks of a single colour in a single storage box so I will need to acquire another six boxes for the overflow. The additional box will contain the modern unit types - tanks, trucks and infantry support weapons - and, when I finally get around to it, certain pre-gunpowder types. Still, it is finally completed so the next step will be to cut out and label the new addition and so I hope to be doing this over the next few days. The artillery labels. By using the same system (the black and white strip) I can at last differentiate between calibre/types of guns in use. It has been a busy weekend for a variety of reasons with little done on the gaming front. This was not actually a bad things as much of what was done has been outstanding for a few weeks so at least now the domestic list is looking a little more restrained! 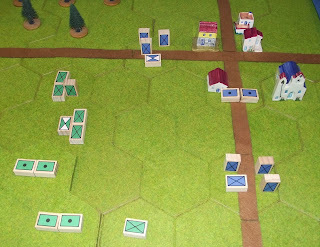 I managed to draft up the additional artillery sheet of block labels (see above) and have printed them off. With the other types it means that I now have an additional 360 blocks to label. This is not difficult to do and is something that can be readily tackled when parked in front of the TV. I will need to reorganise the storage boxes somewhat and so have decided that the modern blocks will be stored separately from the core blocks of infantry, cavalry and artillery - simply because I game less often with tanks etc. All being well this lot should be ready for next weekend and although I shall be equally busy then I am hopeful that I will be able to game in at some point. The new labels - note the black and white trim. Since my last post I have been messing about with designs for the additional troop types I wanted to make available for my block armies. The main criteria was that the design needed to be visible on the table top. It also needed to be simple to produce and in keeping with the existing designs. The symbols I have used are mainly based on standard NATO map symbols although the commander block is derived from the maps that feature in David Chandler's book - The Campaigns of Napoleon. I considered a number of ideas but eventually settled on the technique you see above - the use of plain black or white bars across the bottom edge of the symbol. Aside from using this idea with infantry and cavalry - for grenadiers, light infantry and varying cavalry 'weights' - there is no reason why I should not use the same method for varying artillery types and even modern equipment - tanks and similar. 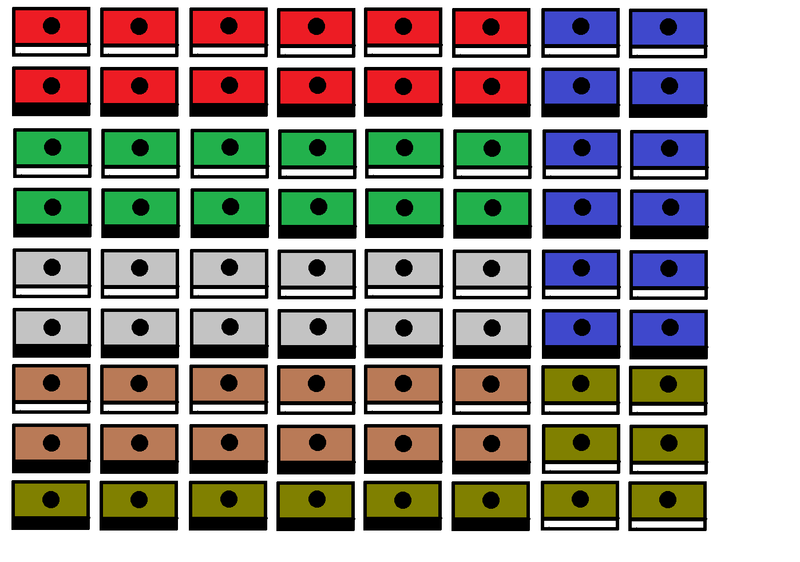 Initially I was only going to tackle the red, green and blue armies but have decided to extend the scope to include all the colours I possess. Luckily I have more than sufficient Jenga blocks cut in two to be able to do this. I am planning on labeling the blocks over the next day or two and will be sure to post some pictures when they are ready. One of the things that has been niggling away at me for some time - and of all things the Pirate ships I recently acquired have added to this - is the small but significant point of how best to differentiate between troop types using my well tried and trusty block armies. Now I realise that the good Lt. 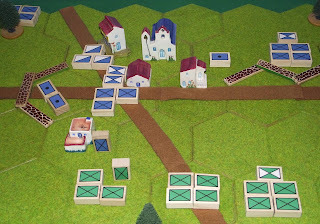 Colonel and Brigadier would view my use of blocks for gaming in a more civilised era as bordering on heresy but I would defend my position by saying that I have a number of very special ideas that I am sure that they would approve of. Eventually. 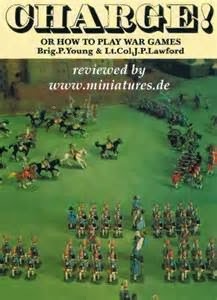 I hope to have the first additions ready to roll out by the weekend - all I need to do now is to take Bob Cordery's Itchy and Scratchy 19th century rules and tweak them back into the 18th century. The following action will probably look rather familiar to most readers as it is, in effect, a slightly larger version of the previous effort (game number 43) which in turn was loosely inspired by the game that Bob Cordery and I had a while ago, shortly after the man cave was commissioned. 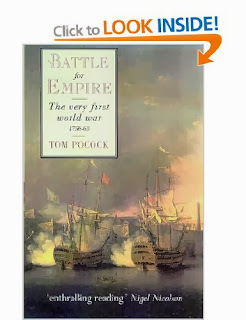 I offer no apologies for this - my interest in the Russo Turkish War is well known and I was unable to resist the urge to revisit it! 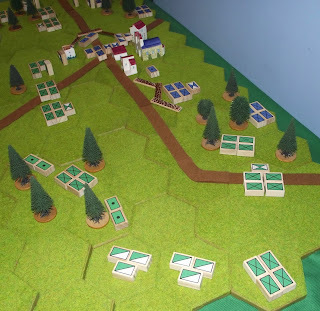 A divisional sized force of Russians under the command of General Chestikov has been tasked with securing a small village located at the crossroads of a vital communications route for the Turks. The Turks meanwhile had anticipated the Russian move and so had hastily dispatched a reinforced regimental sized formation with instructions to hold the vital village at all costs. By means of a forced march the Turks, under the command of Pasha Nkeyk, had reached the village before the arrival of the Russians and so had managed to not only secure it but to also bolster the defences with some field works. 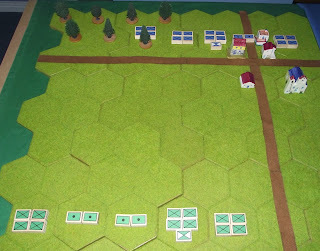 The Russians had arrived at their starting positions in the early hours of the morning and so decided to invest the village shortly after first light. As far as they were aware the defenders would be few in number and so unlikely to offer a prolonged resistance. With this in mind the General Chestikov decided to take the village from three sides, using the terrain on either flank to mask his intentions. If successful, this three-pronged attack would ensue that any defenders would be unable to escape except back towards their own lines. From the Russian perspective the forthcoming action should be relatively straightforward but the commander had a healthy respect for the Turks - especially when fighting from cover. The Turks needed to hold the village for twelve hours by which time the main body of the army would have redeployed into its new positions meaning that reinforcements would be readily available. Pasha Nkeyk was under no illusions that this would happen early on and so, grim-faced, he readied his men and awaited the coming storm. I used Bob Cordery's Itchy and Scratchy Rules to fight the action and there were to be 12 game turns. 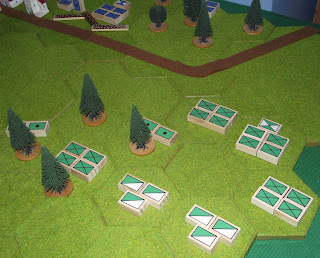 Any hex with a building on was classed as a BUA and the two Turkish artillery redoubts counted as cover only against fire coming in through one of the 'walled' hex sides. The Turks did not have enough time to construct anything more substantial prior to the Russian attack. As the sun rose the Russians realised that the Turks held the village in greater strength than first thought. 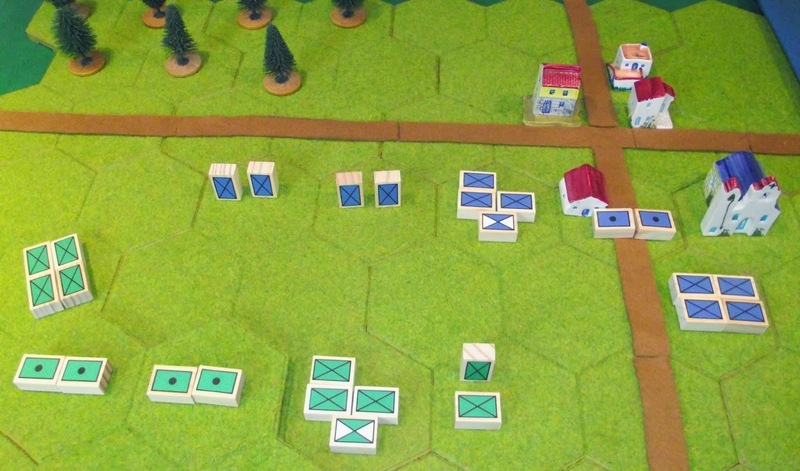 Even so, Chestikov was confident that he could prevail, especially as either flank offered an opportunity to get close to the Turkish position using the terrain to cover their approach. The Turks deployed in cover - either in the village, within the field works or the woods on either flank. 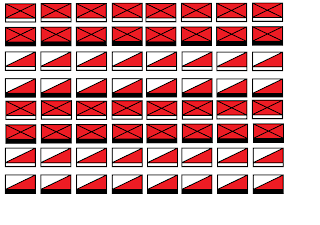 Pasha Nkeyk kept half of his cavalry and a single infantry unit in reserve. The heart of the Turkish position showing the cavalry and infantry held in reserve. 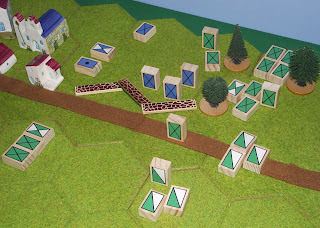 Pasha Nkeyk set up his command post in the centre of the village. 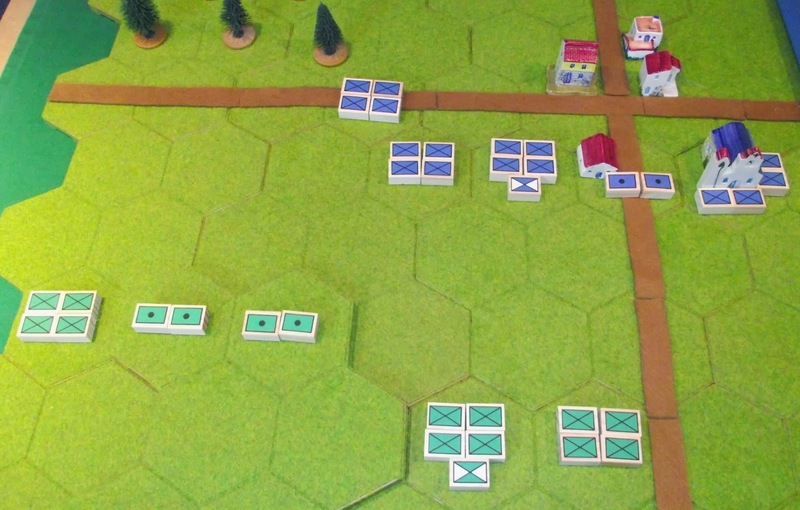 The start of the action shows the Russian advancing on a broad front but with the flanks managing to forge ahead of the troops in the centre. 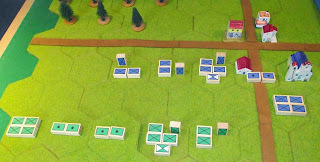 By a command oversight the artillery initially deployed outside of effective range so hastily limbered up and followed the infantry and cavalry they were due to support. Meanwhile, the Turks were content to be spectators although their commander knew this would not last for long. With remorseless intent the Russians continue their advance. 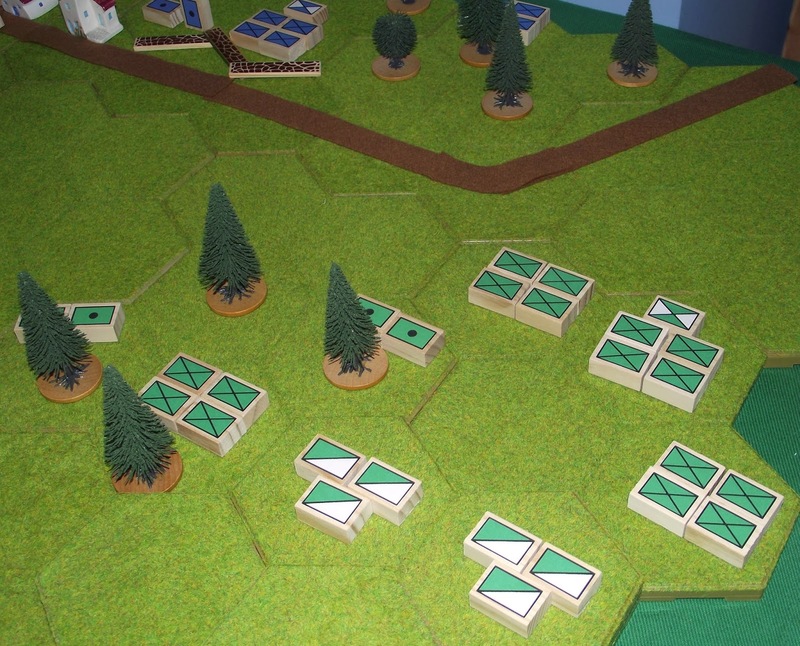 The flanking formations, using the terrain to the utmost, are almost in contact but the centre has only just assumed its attack formation. 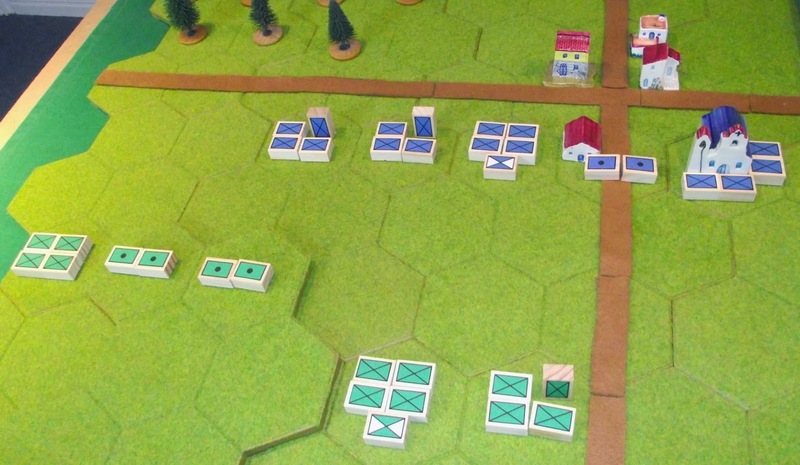 The redeployed Russian artillery has at last come into action and manages to draw first blood by destroying half of the Turkish artillery in the right hand redoubt. In the centre the Russian infantry are at last ready to commence their attack, supported by their artillery. 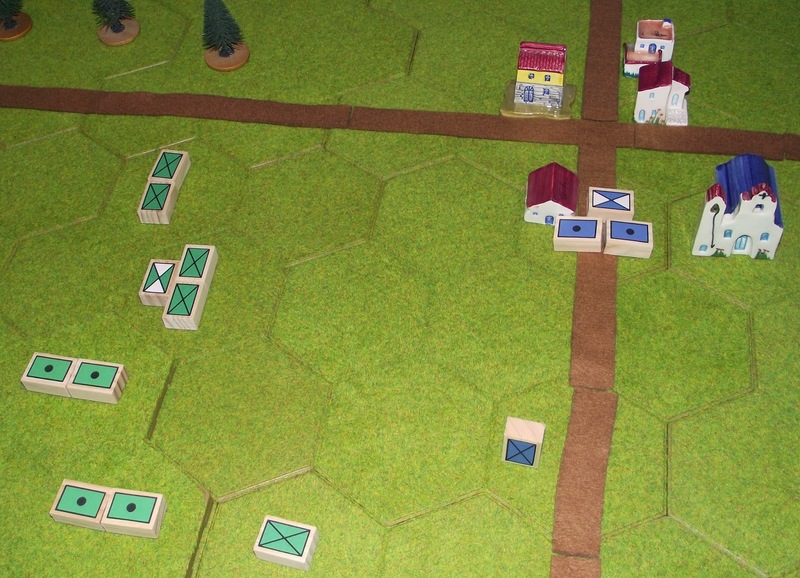 On the Russian left the attack develops though the woods with the cavalry and artillery in support. Meanwhile, with grim resolve, the Turks ready themselves for the impending attack. 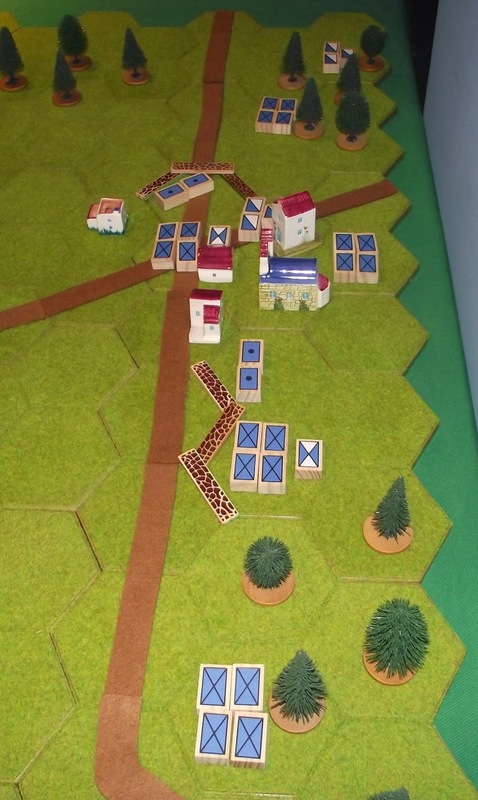 Meanwhile on the right flank, with the infantry in the van, the Russian attack approaches the Turkish position. Upon sighting the mass of green coated infantry bearing down on them the sole Turkish defenders opt to fall back deeper into the woods. With a bloodcurdling cry the Turkish horsemen crash into the first of the Russian cavalry units. After a brief but vicious struggle the Russians are forced back with losses. Their supporting regiment of horse manages to exact a swift retribution against the victorious Turks though, charging and destroying the disordered remnants. Enthused by the success of their fellow horseman the surviving Russian cavalry, from the unit recently bested by the Turks, attempt to drive the Turks from their position in the woods. Despite managing to inflict some casualties the remaining horseman are shot down. 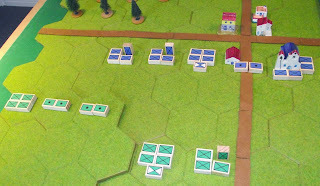 On the right the Russian attack forces its way into the woods whilst the central formation moves up to the Turkish field works. 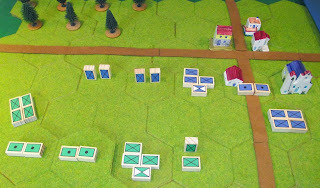 The first attack against the village results in equal numbers of casualties but the Turks, perhaps mindful of the supporting Russian infantry, are forced back. 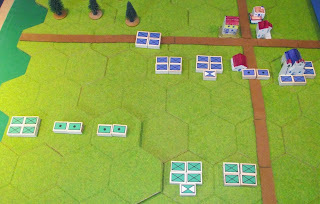 On the left flank though, a coordinated and punishing Turkish attack involving firstly the two infantry units, secondly the artillery and with the coup de grace being delivered by the cavalry; the right flank Russian infantry unit is destroyed under the weight of rifle, shot and cold steel directed at it from all directions! The remains of the Russian cavalry, recently victorious against their Turkish counterparts, then proceed to suffer the same fate as their predecessors at the hands of the same Turkish infantry unit. 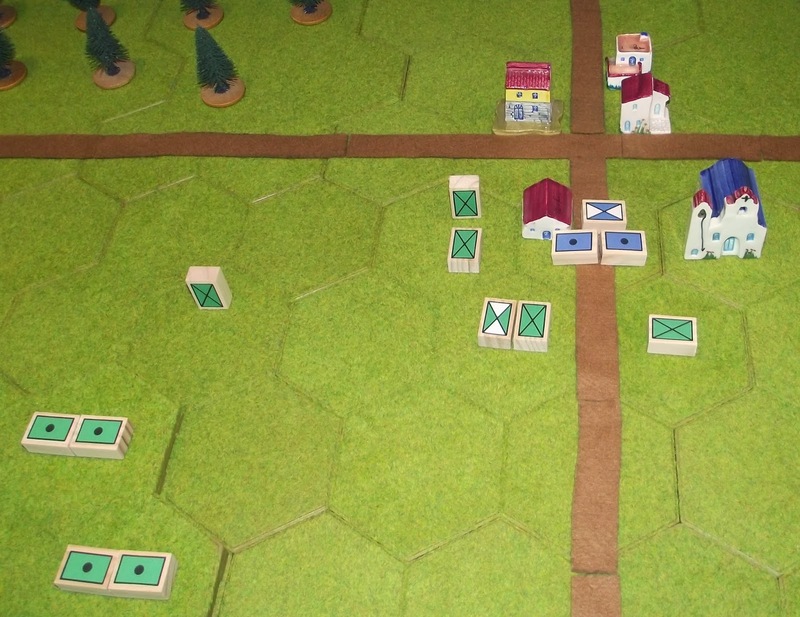 Thus far the Russian attack is faltering on this flank. 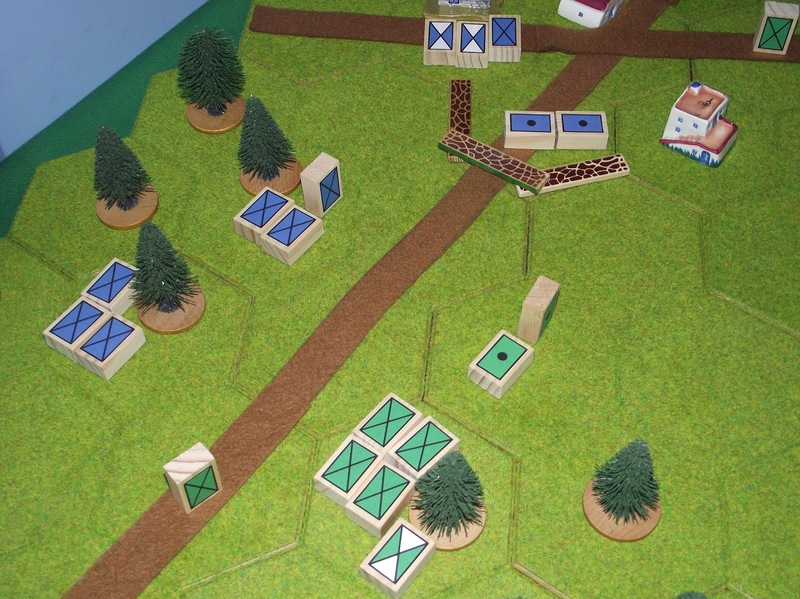 The Russian attack through the woods meets with a setback at the hands of the Turkish riflemen as the tide of green coated infantrymen comprising the centre formation crash into the main redoubts. A desperate struggle at point blank range ensues. With a herculean effort the Turks beat the Russians in the centre back with devastating losses. The battle swings in the balance though as the Turks in the wood to the rear of the redoubt are finally driven out by the victorious Russians. 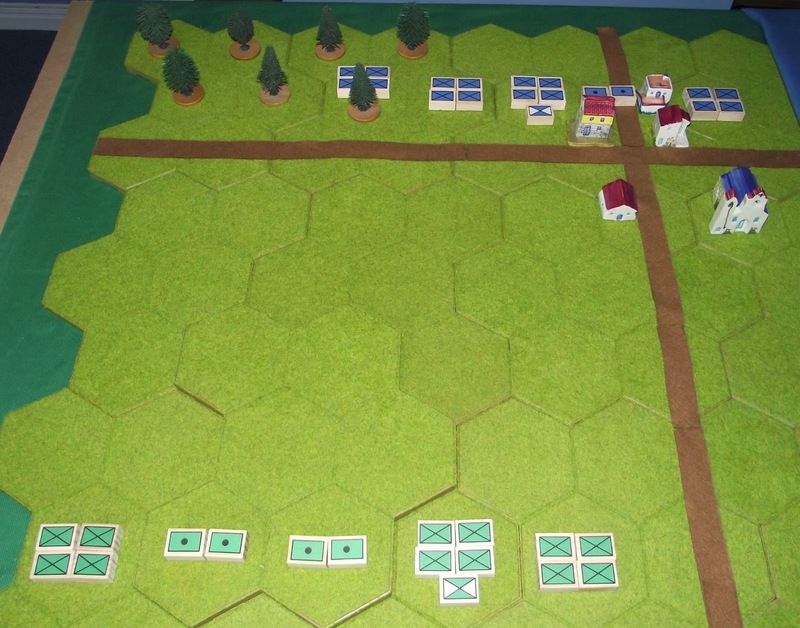 Meanwhile, on the opposite flank, the two sides face off on either side of the dirt track with neither side displaying any degree of eagerness to force a conclusion. The decisive blow. After having hacked their way through the undergrowth and driven off the Turkish defenders in the wood at last the Russians emerge behind the enemy redoubt. With volleys of rifle fire and slashing of bayonets the green coated horde sweeps into the now unprotected rear of the Turkish position and with a cry of 'Urrah!' the Russian infantry storm the redoubt! 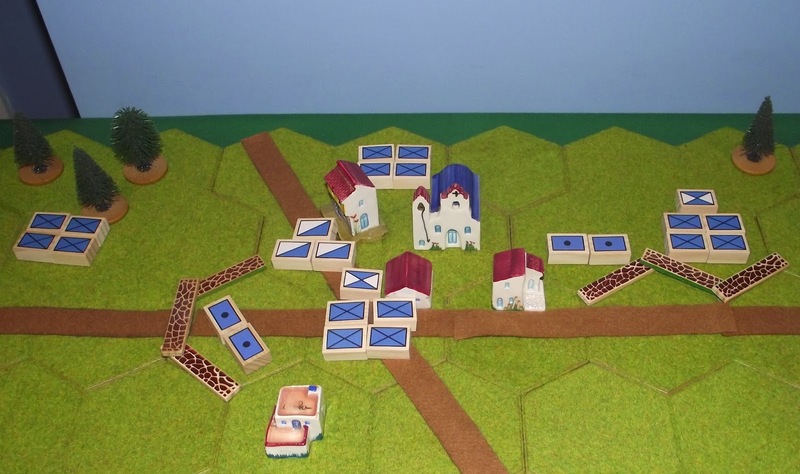 The village, so gallantly held and bitterly coveted is on the verge of falling to the Russians. 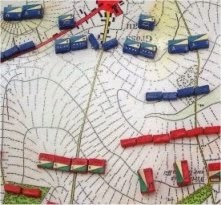 At this point both sides had exceeded their respective Exhaustion Levels but, as the Russians had managed to break into the Turkish position they were deemed to have carried the day. The final score was Russia: 35 strength points lost and Turkey: 20 strength points lost. 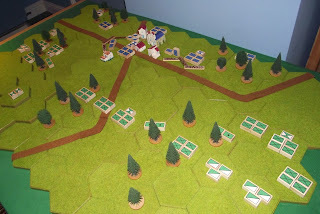 As the Russian right flank victoriously surged into the redoubt and the village the left flank maintained its watching brief against the Turkish units defending the woods to their front. The forlorn attempt to prise them out of their position, not for the fist time that day, failed ignominiously. Meanwhile, unaware of the fate of the rest of the garrison, the Turkish artillery gleefully battered their Russian counterpart with what proved to be the final exchange of a bloody day. General Chestikov was aghast at the losses his proud division had suffered - his infantry was now little better than a brigade. 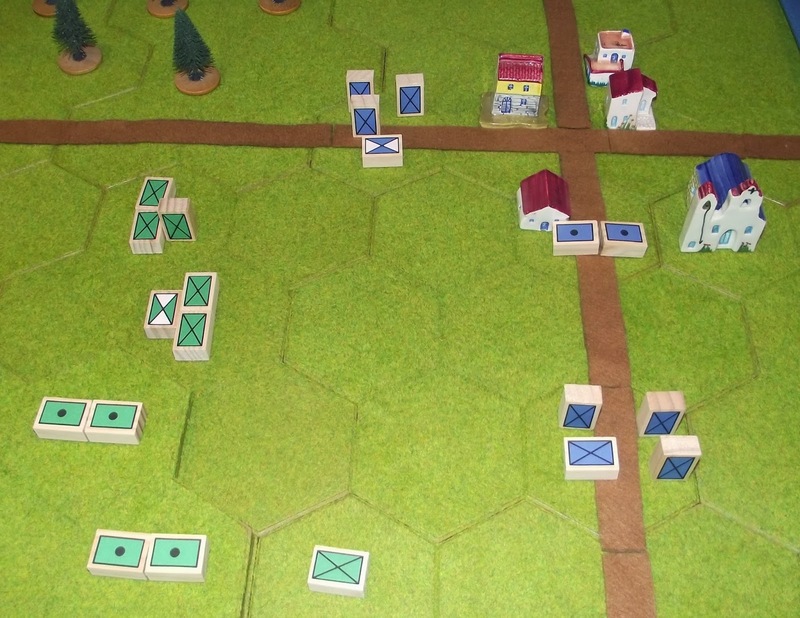 He had lot half of his cavalry in foolhardy action against infantry in woods and his centre formation was battered unnecessarily by taking what seemed like an age to get into contact. Luckily it did when the right flank attack went in as it gave the Turks much to think about from all directions. It was a much harder fight than he anticipated and in the end it was down to numbers. He made a mental note not to underestimate the tenacity of his opponents when defending a position again. 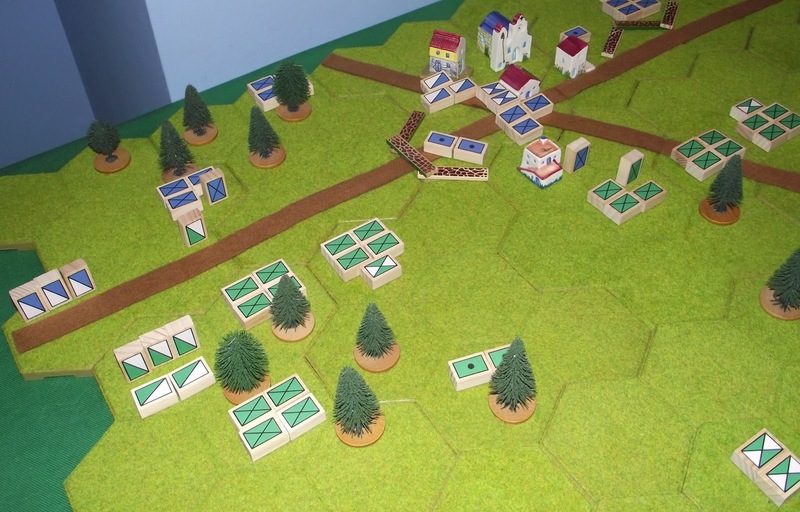 Pasha Nkeyk knew the day was lost when streams of his panic-stricken infantry ran across the rear of the redoubt with a veritable green tide in hot pursuit. He took the situation in at a glance and made ready to beat a hasty retreat. A runner was sent to the remaining troops in the village and the woods on the opposite flank to the Russian break in and they gradually managed to disengage. The battered survivors, with Pasha Nkeyk at their head fell back from the village with the Russians too exhausted to pursue. I actually felt quite drained at the end of this fight! It was a very close run thing right until the final game turn (I played 6 out of the 12 planned) despite the disparity in numbers. The Turks fought back hard and actually bettered the Russians on their left and the centre. 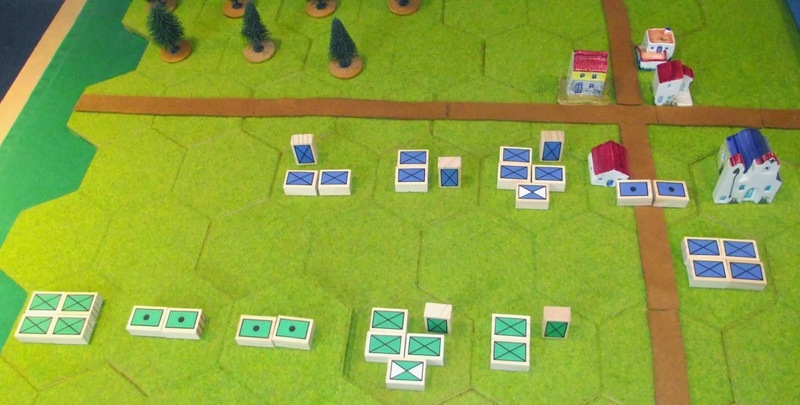 The battle was won on the Russian right flank and I think that the Turkish decision to send the reserve infantry to the opposite flank early on may have tipped the balance in Chestikov's favour. The rules demonstrated the increasing power of the defence - especially behind any form of cover - and played magnificently. The game was tense, exciting and enormous fun to play. Since I have been fortunate enough to be back in the workplace and in a job I am enjoying my hobby related time has been pared back to the bone. This situation is unlikely to change in the foreseeable future and so a fairly drastic rethink has been needed about what I can and cannot do in the short term. My grandiose project list has taken a battering and any kind of schedule has been completely derailed. To be honest, I found this to be quite demotivating. I have therefore taken the decision to space out my projects and ideas - actually more like abandon them in the format envisaged - and tackle things on a 'little and often' basis. My ideal would be to only undertake those things that I could realistically get completed over a weekend so in my case that means that any painting will be very small scale. If I plan a game for a weekend then the paintbrush may not even see the light of day. 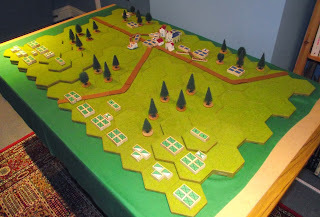 I really enjoy my solo games and find the whole process of thinking about a scenario, organising the forces, creating a terrain to fight over, playing the game and writing about it afterwards to be enormously relaxing and so my focus will be on these for a while. For the umpteenth time I am so glad I persevered with the block armies for without them I am not sure what I would be able to get done in the limited time I seem to have. In fact, the block armies will be getting a minor tweak as I want to add some additional unit types - more of which later. The following action was fought very much on the spur of the moment and was very much by way of an experiment. 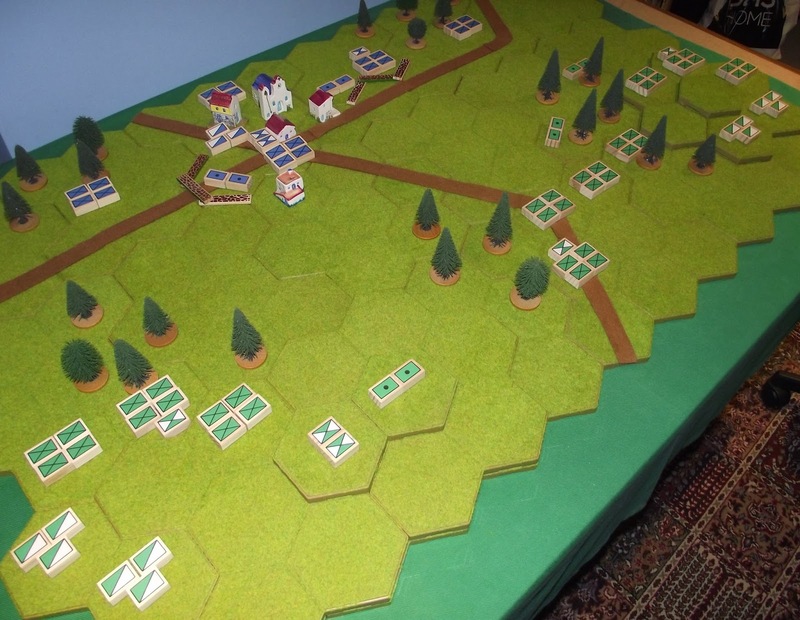 I wanted to try the scenario generation system from Neil Thomas's Wargaming 19th Century Europe 1815 - 1878 with my block armies and the latest version of Bob Cordery's 'Itchy and Scratchy' rules. I want to try the rules from the book in due course - once I have 'hexed' them - as they have a number of effective looking ideas contained therein. For the moment though, I will make use of Bob's rules. 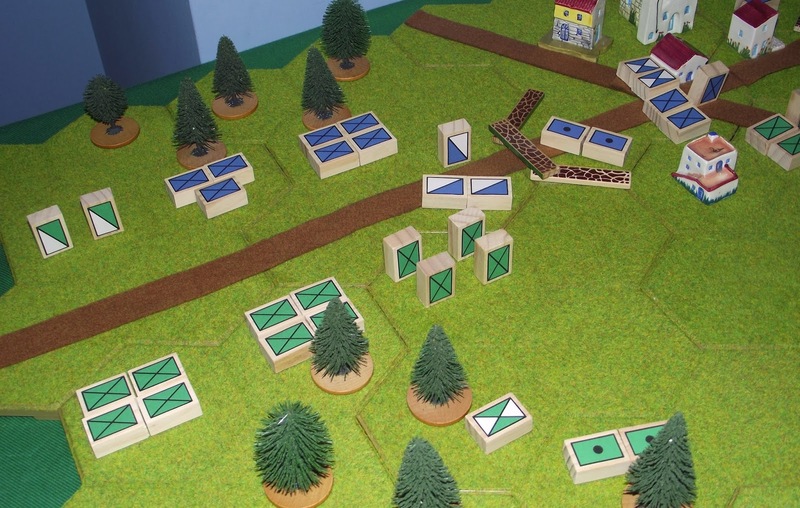 The terrain was based on that used for the mini game (usually fought on a 2ft square area) variant and the units for each side, and the starting edges of the playing area, were determined randomly based on the tables provided. The two combatants - Russia and Turkey - rolled 5 and 6 respectively meaning that the Russians fielded 3 infantry units and 2 batteries of artillery whilst the Turks has 4 infantry units and a single artillery battery. 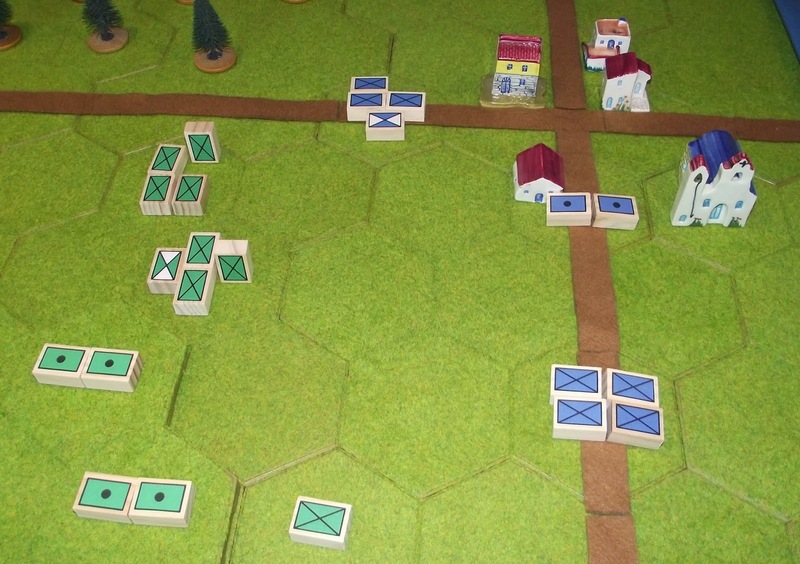 All the infantry units consisted of 4 blocks whilst the artillery had 2. The C in C for each side consisted of a single block. This meant that the Russians had 17 strength points (exhaustion level 8) and the Turks had 19 (exhaustion level 9). The action was fought using the Hexon tiles, configured 9 x 8. 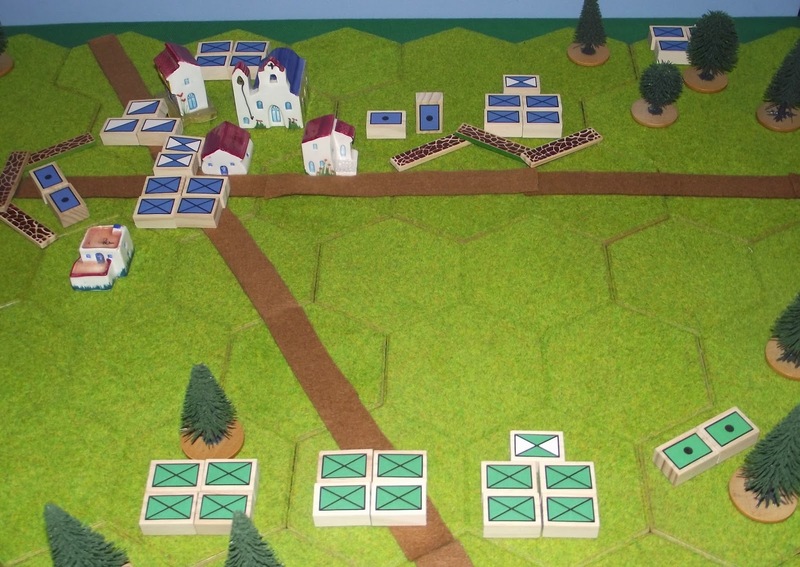 The Russians (the green blocks) are attacking from the East. The two objectives - the hill occupied by the Russian artillery and the small town - have to both be captured in order to secure a victory. 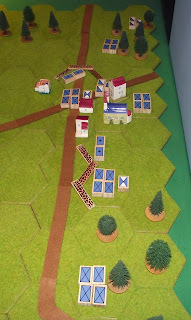 The Turks opted to move their artillery through the town with the bulk of the infantry facing the enemy occupied hill. 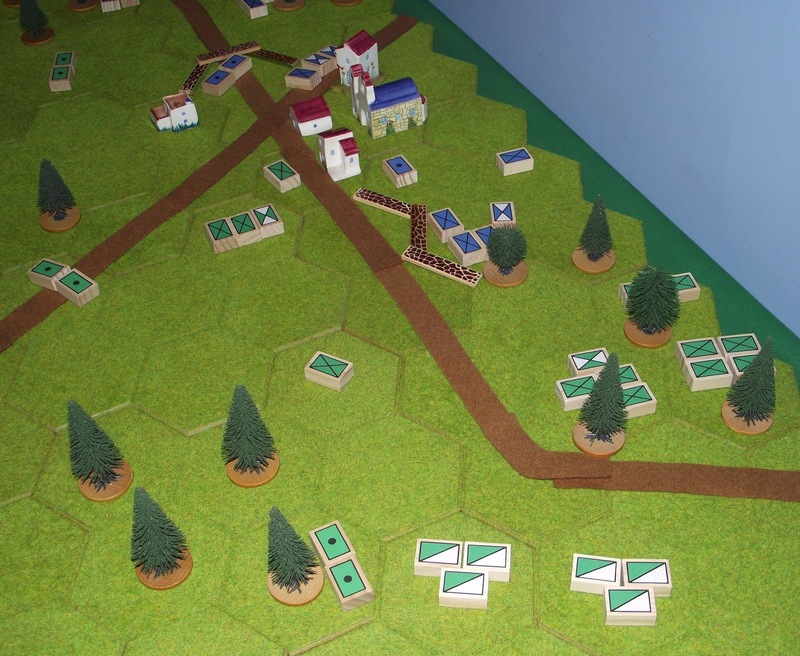 The Russians opted to deploy their artillery on the hill with the infantry in support and facing the town. 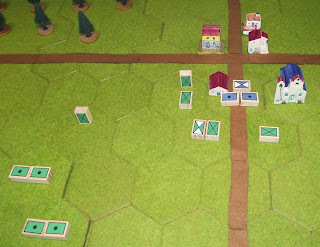 Turn 1 sees both sides moving up into the attack. The Russians push their artillery to the edge of the hill giving it a superb field of fire whilst their infantry deploys to assault the town. The Turks likewise consolidate their hold on the town and ready their infantry to attack the Russians. Turn 2. Conscious of their slight inferiority in numbers of infantry the Russians content themselves with using their artillery to telling effect. The Turkish artillery is also quick to register a hit on the nearest enemy infantry. Turn 3. With Russian artillery battering his infantry the Turkish commander moves up a fresh unit from the town and opens up a murderous long range fire. Still the Russian shells rain down. Turn 4. The Russian artillery continues to batter the opposing Turkish infantry into submission, helped by some flanking rifle fire. Meanwhile, to relieve the pressure on the opposite flank the Turks steadily reduce the Russian infantry with a withering long range fire. Turn 5. 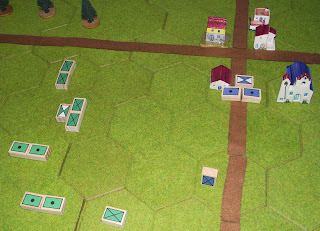 Seizing their chance the Russians quickly redeploy their artillery whilst the infantry swing around to assault the town. Despite the Russian casualties it is the Turks that are on the brink of reaching their exhaustion level first. Turn 6. The momentary respite from the redeploying Russian artillery gave false hope to the Turks as it was soon back in action and to telling effect. 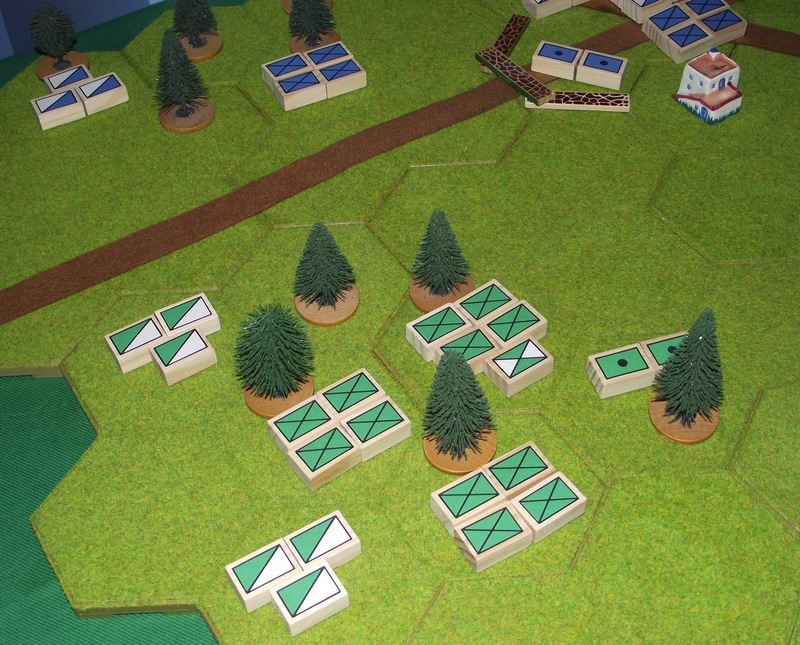 Sensing victory, the Russian commander urged his infantry forward to capture the town. Turn 7. The remains of the Turkish force fall back on their artillery in the town whilst the Russians make ready for their assault. Turn 8 (and I am sorry to say the last of pictures). The Russians attempt to batter their way into the town but have not reckoned on the tenacity of the Turkish artillery and their resolute commander. Turns 9 and 10 saw successive waves of Russian attempts to storm the town being fought off by the Turkish artillery. 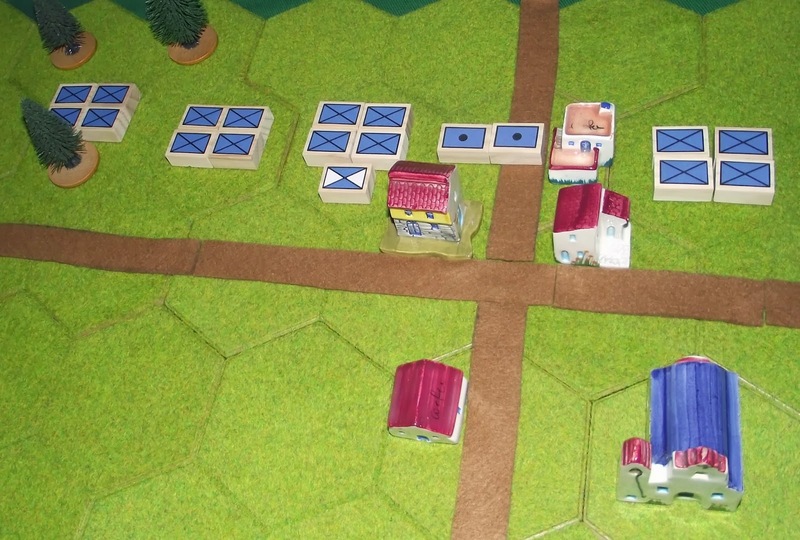 The Turks lost a point of artillery but the Russian lost all 4 of the infantry points remaining and also the C in C. As neither side was able to secure the two objectives the result was inconclusive. Under the strength point system the game should have ended in turn 6 with the Turks being forced to go on the defensive. 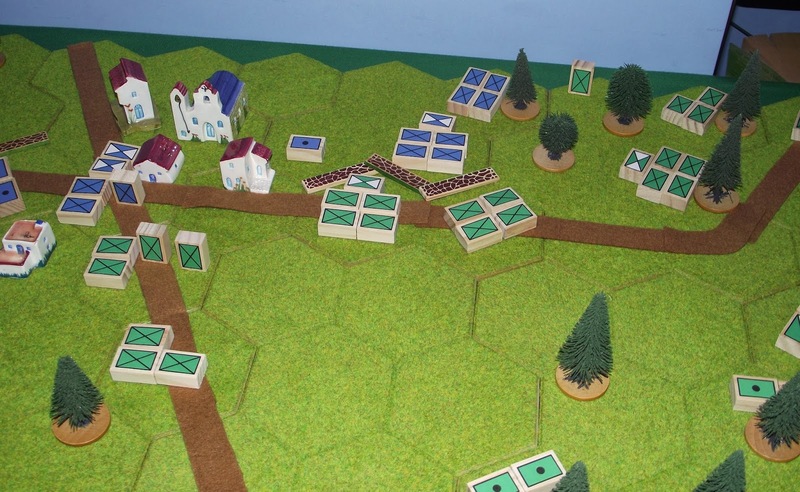 I opted to observe the scenario instructions whereby to win a side needed to secure both objectives - the hill and the town. 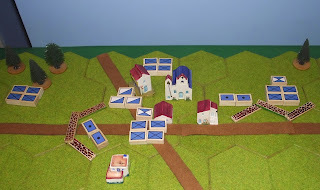 As it turned out the Turks fell back and denied the Russians the town so overall the result was the same. Although this was a small action it was not without a certain amount of interest - not least of which demonstrating the danger of remaining stationary whilst under artillery fire. It also revealed how dangerous a close combat could be when the opposition 'battles back'. 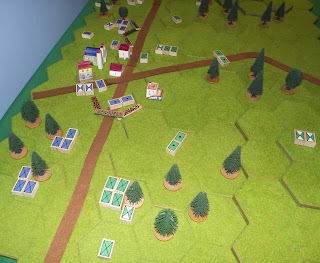 The Russians were very unlucky against the Turkish artillery in the town and it showed just how important the use of cover is when outnumbered. I shall experiment further with the ideas of Neil Thomas as they offer some interesting ideas for the gamer - especially when fighting solo. It was a pleasant way to spend a rainy Saturday afternoon when all is said and done. Author you've read the most books from: Arthur Ignatius Conan Doyle without a doubt - Holmes, Challenger and Gerard - need I say more? Major book hangover because of disappointing endings: Seven Pillars of Wisdom - unsatisfactory all round really. An eclectic mix for sure! Lots of ideas for some cracking small scale combined arms type actions. Over the years I have taken part in some truly epic 18th century battles set, for the most part, in the period of the Seven Year War. I even flirted briefly with the idea of producing a Swedish army to fight against the various other forces that had been raised - Prussians, French, Austrians, British and others. Back in the day the rules of choice were either Charge! (using half sized units) or Frederick the Great. 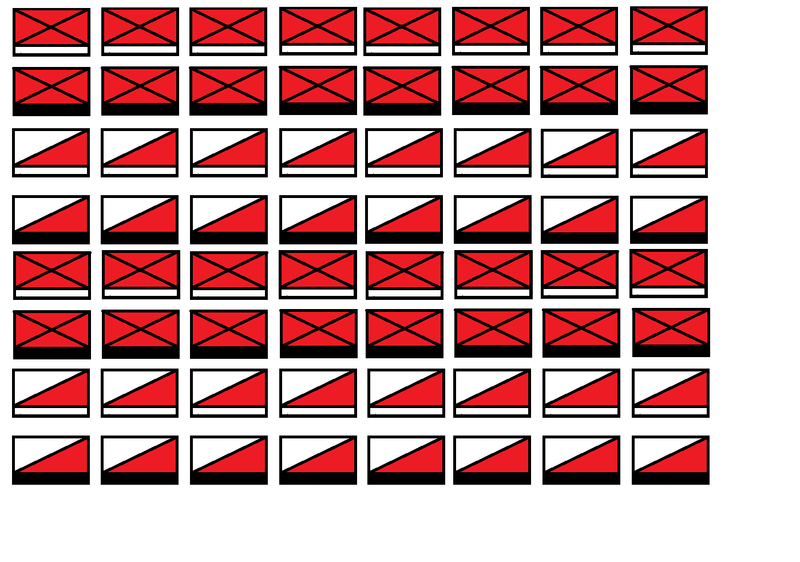 The one thing that I never tackled though was the naval side. Fast forward to 2013 and what do we have now? I am probably even further away from painting an army for this era but I do have the material needed to tackle some of the naval side in the shape of the 150-odd Pirate Ships from the Pirates of the Crimson Coast game. Aside from the naval side I have also found myself drawn to the fighting across the far flung cornets of the globe - namely against the French in America and India and the Spanish in the Caribbean and the Philippines. Lacking any meaningful reference for this era I managed to pick up a copy of the book you see above - and what a cracking title it is as well. It is probably not the most detailed account you will ever read but as a primer and a source of inspiration it ticks an awful lot of boxes. 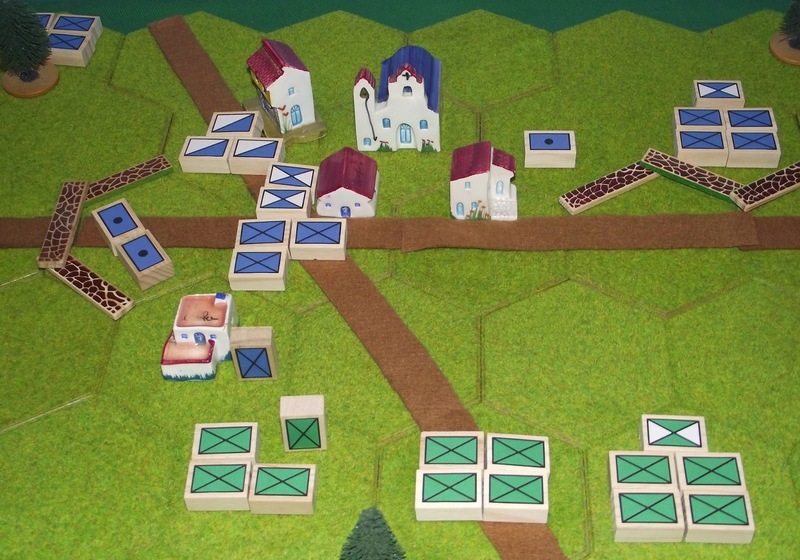 It would be a simple matter of using the blocks for the land actions and the ships for the naval side so the potential for something a little bit different is certainly there - in fact on this basis I have absolutely no reason to not give this some serious consideration as everything needed is to hand. One to consider in a little more detail methinks.